BBTS Sponsor News: MOTU, Bill & Ted, Dragon Ball, One-Punch Man, Muppets, Bandai Spirits, DC Multiverse, Captain Marvel & More! The Masters of the Universe Collector's Choice series continues with the William Stout Collection! Super7’s super detailed deluxe 7-inch Masters are based on the legendary 1987 MOTU production art created by William Stout! Each highly articulated figure comes complete with accessories. These awesome anime figures are available for pre-order from Banpresto! Each collectible figure features special sculpts and paint application, making them some of the most unique additions to any collection. McFarlane brings fans their favorite characters as 7-inch action figures! Each figure is fully customizable with their Ultra Articulation, full range of motion, and comes in window box packaging. Grab your favorite anime, movie, video game, and TV show characters (or mecha) as articulated figures, model kits, and statues from Bandai Spirits! Each collectible features series-accurate sculpt and character-specific accessories. Fans and collectors will love these highly detailed 6-inch key DC character figures. Each one features 20 points of articulation, detailed battle suits, authentic paint, iconic elements, and a bonus piece to build Ninja Batman! Toynami is proud to announce the second series in the Naruto Poseable action figures line! You can choose from three of your favorite characters: Sasuke, Gaara and Pain. Each figure is fully articulated and features accessories and display stands! From Bandai America, we have 3 new sets of Dragon Ball Super figures! First are the 5-inch figures with Goku, Vegeta, and Broly. Next are the 12-inch Limited Breakers with Goku, Vegeta, and Frieza. Rounding out the release are the 13-inch Limit Breakers featuring two versions of Broly. The Marvel Comics Battle Diorama Series statues are in 1/10 Scale and feature battle themed bases that can be positioned together to create a scene. Each limited edition statue is sculpted with extreme detail and is hand painted. Iron Studios is proud to announce the Batman Deluxe Mini Co. Collectible Figure from the Mini Co. Hero Series line. These hand-painted collectible figures were created by Iron Studios and are the perfect size for any desk or shelf, no matter the size of your collection. ReadySetz playsets feature 360 degrees of vibrant, photorealistic graphics with multiple levels for photography and play. No assembly required and the play sets fold up for easy storage or travel. This ARTFX J series statue depicts Katsuki Bakugo, from the anime series My Hero Academia, in a moment of truth as he prepares to face off against a villain! The long-awaited debut of Mobile Suit Gundam 0083 in the popular ROBOT SPIRITS Ver. A.N.I.M.E. line! The first to get the treatment from the classic anime are the RX-78 GP01 and RX-78 GP02A. The 30 Minute Missions series is a customizable model kit line compatible with all other 30MM kits and packs! When completed, each 30MM mech stands about 5 inches. You can also grab accessory packs to build onto your mechs! From the Star Trek: The Next Generation television series, the AMT USS Enterprise-D and Polar Lights Enterprise NX-01 model kits are molded in their original colors and feature simple snap fit assembly. Now you can own, build, and customize your favorite Hexa Gear characters and mecha as expansive model kits from Kotobukiya! Joining the Metal Earth ICONX Premium line are a series of Game of Thrones kits. These do it yourself (DIY) ICONX Premium Series kits begin as steel sheets that assemble into a fabulous 3D miniature model. Easy-to-follow printed instructions are included in every package. Figma figures feature smooth yet posable joints that allow fans to recreate different scenes from their favorite series. With so many options, there’s something for every kind of fan. Nendoroid figures were created with fans in mind, taking popular characters and shrinking them down into chibi mode! Each adorable 3.9-inch figure comes with interchangeable facial expressions and accessories, perfect for displaying in different ways. Pop! figures bring your favorite iconic characters to life with a unique stylized design. Each vinyl figure stands 3 to 6 inches tall and comes in window box packaging, making them great for display! From MegaHouse comes your favorite anime and manga characters! Each collectible figure features special sculpts and posing, making them some of the most unique additions to any collection. These custom box protectors are made of 0.4mm thick, acid-free archival grade PET plastic. The crystal clear and water resistant design is perfect for protecting and displaying your favorite standard size S.H.Figuarts and Pop! figures. These beautifully-crafted 1/6 scale accessories and weapons can be displayed with the Hunter statue from Gecco or the optional accessory Collection Board. It’s that time of the year: the Spring Sale is back! Grab that item you’ve had your eye on before it’s gone at a deep discount; from Transformers to Star Wars, there’s something for every kind of fan. SPRING SALE: 1000 ITEMS 50-80% OFF! Add onto your Pile of Loot with these other deeply discounted items! Reach past the big screen and build the ultimate Transformers collection with Studio Series figures, inspired by iconic movie scenes and designed with specs and details to reflect the Transformers movie universe! Megahouse brings fans the ultimate collectibles from new and old anime series! From Naruto to JoJo’s Bizarre Adventure, there’s something for every kind of anime fan. Immerse yourself in the Legacy of the Beast universe with these highly detailed PVC statues and ReAction figures from Maiden Collectibles and Super7. Collect all your favorite members and become part of the Iron Maiden Legacy! Build your own Star Wars vehicles and droids with the IncrediBuilds Star Wars book and model set, featuring a full-color booklet filled with amazing facts and awesome imagery of the craft in action. The classic Planet of The Apes film series joins the ReAction figure line up from Super7. Relive the golden age of toys with these retro-styled figures. Based on their appearances in the Predator series comes this line of 1/18 scale figures! Featuring full articulation and character specific accessories, these figures stand between 3 to 5 inches tall. From Joy Toy, the Russian Reengineering and Federation figures are incredibly detailed in the 1/18 scale. Each figure is highly articulated and includes weapon accessories as well as several pieces of removable armor. Based on the Mega Man: Fully Charged animated series, each basic Mega Man figure from Jakks Pacific is fully articulated and stands about 5 inches tall. From Mastermind Creations, each Reformatted figure transforms from beast or robot mode to vehicles. The Reformatted series features highly detailed figures with amazing articulation that can combine with other bots from the same series! These door mats are made of heavy-duty coir matting with a durable vinyl backing that makes it suitable for outdoor use. Officially licensed and measuring 17x29 inches, each door mat is a unique gift for any Star Wars or Nintendo fan! Funko brings your favorite characters to life with a unique stylized design. Each vinyl figure stands 3 to 6 inches tall and comes in window box packaging, making them great for display! These PX Previews Exclusive collectibles feature limited edition figures and statues from all kinds of comics, TV shows, and movies! Anime and video game fans can enjoy exclusive figures, model kits, and statues from Bandai Spirits and X-Plus. Don’t miss out on these limited edition collectibles! These Marvel designer statues feature a unique style created by Tracy Tubera AKA the Über Illustrator Supreme. His style consists of graffiti, anime, and comic book art. His artwork has an acute attention to sharp, crisp line work with splashes of bright pop colors. He mixes pop culture imagery with his love for sneakers, Super Heroes, and humor to create imagery all his own. DC Comics fans can grab new kitchenware, gadgets, accessories, and even rubber duckies from Paladone! Horror icons from Child’s Play and Jaws are available as socks and trading cards from Fright-Rags! Get back to school or show up for work with these stylish (and nerdy) bags, accessories, and wallets from Bioworld and Loungefly! Deck your home and kitchen with these awesome mugs, lunchboxes, glasses, and more! From Alien to Star Wars, these collectibles are perfect for fans of any series. Recreate thrilling movie adventures with Shazam!, Freddy, Mary, and Pedro! Each highly detailed figure comes in 6-inch scale with 14 points of articulation, an authentic costume, and an enemy of man figure! Safari’s figures and toys bring collectors of all ages unique and incredible mythical creatures: dragons! By the Power of Grayskull! Each Masters of the Universe Classics Club Grayskull figure stands about 7 inches, are highly articulated, and fully poseable; all carefully sculpted by Four Horsemen. Each come packaged in a brand new blister package featuring new artwork inspired by the iconic vintage toys. Mego Corporation has created all your favorite monsters as 8-inch action figures. Each high-quality figure features real fabric clothing and 14 points of articulation. From Star Wars: The Phantom Menace and Revenge of the Sith these highly detailed adult collectible lightsaber features authentic sound effects, a real metal hilt and includes a specially designed display base. With refined features and elaborate details, the Black Series embodies the quality and realism that Star Wars devotees love. Recreate the ultimate battle with Transformers War for Cybertron: Siege, featuring classic G1 characters. Siege plunges fans into the epic fight to survive on the final day of the Autobot and Decepticon battle to control Cybertron. These DC Primal Age figures are designed just like toys from the ‘80s and feature your favorite DC Comics characters as super-ripped epic action figures. These 5.5-inch scale action figures feature limited articulation and collector friendly window box packaging that’s perfect for display. Don’t miss your last chance to get these must-have figures and collectibles from the Matty Collector series! Nendoroids feature your favorite character, but in adorable chibi form! Each Nendoroid stands about 3.9 inches and come with accessories and facial expressions to act out different scenes and poses from their respective series. These Super-Flexible Female Seamless Bodies feature an internal stainless-steel armature that has 22 points of articulation. Each joint is designed to move freely with 90% accuracy of real human movement. The body is made of a non-toxic environmentally friendly material giving the figure realism. With the Marvel Legends Series, both kid and adult Marvel fans can start a legendary collection of comic and movie-based Marvel characters. Each 6-inch figure is highly articulated and features a comic-inspired design, making it another worthy addition to the Marvel Legends Series. Collect all figures in this Spider-Man Legends Series Build-a-Figure collection to assemble Marvel's SP//dr! Add onto your Heavy Metal collection with the undead tailgunner Nelson and Taarna the Taarakian! These 5-inch figures feature 10 points of articulation and come in blister-card packaging. These awesome Dragon Ball figures are available for pre-order from Bandai Spirits! Each collectible figure features special sculpts and paint application, making them some of the most unique additions to any collection. Mcfarlane has release three new figures into their Fortnite line! Two regular seven-inch figures (Dark Bomber and Jonesy) and one eleven-inch figure (Raven). Complete your collection with these latest additions and create the ultimate display! New DC Marvel Gallery, Minimates, busts, and more are available for pre-order from Diamond Select Toys! Featuring series-accurate paint and sculpt, these collectibles are great for displaying. Anime, tokusatsu, and video game fans: get ready for new and exciting collectibles from series like Fate, Dragon Ball, Naruto, One Piece, Sailor Moon, and so much more! Super7's signature ReAction Figure line continues with Rocky IV! Based on the classic Rocky film where East meets West. Each figure comes blister packaged on a backing card with original paintings of each character. These collectibles from Eaglemoss Publications feature behind-the-scenes looks of your favorite sci-fi and comic series along with scaled figurines! From the whimsical "Chocobo’s Mystery Dungeon EVERY BUDDY!” comes the titular Chocobo! It's ready for any adventure you’re likely to take it on, be it around your home or abroad. Build the ultimate battlefield with Transformers War for Cybertron: Siege figures! 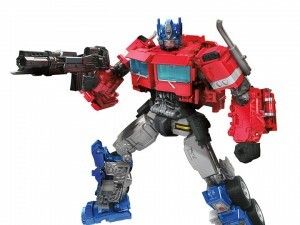 The Decepticon resistance army and the Autobot counter-resistance fighters gear up with the universe's most advanced modular weaponry, including the weapon modes of combined Micromaster figures–sentient bots that combine to form weapons. The next generation of convertible playsets are here—no assembly required! Each playset is in 1:12 scale and is great for 6-inch action figures, toys, and cars. Your favorite Masters of the Universe characters come with their iconic weapons and accessories, as well as name plates for deluxe display. Dscover the comic book-style playbook inside the pack for some nostalgic building! Following the events of Infinity War, fans will find the remaining Avengers more determined than ever to save lives and make things right following the super intelligent warlord Thanos succeeding in his goal of collecting the Infinity Stones and eradicating half the universe. Skillfully crafted based on the main appearance of Thanos and Iron Man in Avengers: Endgame, these highly detailed figures feature incredible likenesses, weapons, and accessories. With the Marvel Legends Series, both kid and adult Marvel fans can start a legendary collection of comic and movie-based Marvel characters. Each figure features detailed articulation, sculpting, and deco, and each one, except Gambit, comes with a piece for the Build-A-Figure of Thanos. Diamond Select has released 7 new items to tie in with the upcoming Avengers: Endgame movie! Three new Gallery figures are up for pre-order, featuring a deluxe Hulk, Premier statues, Minimates, and Mavel Milestones of Endgame heroes and villains. The Avengers are putting it all on the line to defeat Thanos. Show your support for your favorite Super Heroes by adding them to your collection as stylized Funko Pop! figures and key chains. Collect your favorite Sonic characters as adorable figures and accessories! The Boom8 series features each classic character standing about 3 inches and packaged in window-box packaging. From Studio Sundowner, based on the Advent of Marvelous League, the Ganzhiq are smaller stylized figures featuring a newly developed chibi style body. Figures feature several parts and accessories that can be interchanged with other figures from the line. When scientists convert the power of the Morphing Grid into Morph-X, a group of teens are infused with animal DNA to become the Power Rangers Beast Morphers and protect the Morph-X from any villains who may try to steal it! Medicom brings the beloved characters from the first Kingdom Hearts video game to their Ultra Detail Figure lineup! They may be small, but they are packed with exciting detail. ABYStyle makes a tribute to characters from Sailor Moon, Naruto, and One Piece with 3D mugs! Each adorable mug includes a top to keep your drink of choice warm or cool. The Titanus and Megazord from Power Rangers Legacy joins the Soul of Chogokin series, with all of the details and play value you've come to expect! Each Soul of Chogokin Power Rangers figure can be displayed with one another to recreate epic moments from the series. These awesome figures are available now from Banpresto! Each collectible figure features special sculpts and paint application, making them some of the most unique additions to any collection. Figma action figures feature smooth yet posable joints that allow for tons of poses from their respective series! Each figure includes weapons and accessories to display them in various scenes. Enjoy the World of Nintendo with these 4-Inch Action Figures! Characters from your favorite Nintendo games are here to join your collection! Each character comes with a bonus accessory and multiple points of articulation. Each FiguartsZERO figure portrays a moment from the Naruto and Dragon Ball worlds with detailed sculpting and effect parts to accentuate the drama! Series 13 in NECA's bestselling Aliens line is dedicated to the classic Kenner Expanded Universe Aliens of the early 1990s! Taking inspiration from those designs, NECA's team has transformed these Kenner classics into modern versions with all of today's detail and articulation. Fans and collectors will love these highly detailed 6-inch figures based on the Shazam! movie. Each figure features 21 points of articulation, a detailed design, authentic paint application, and alternate hands. Based on their animated appearances with new jumpsuits, new head sculpts and new gear, Peter and Ray measure approximately 7 inches tall while the first-ever fully articulated Mr. Stay-Puft measures approximately 8 inches tall! Plus, these three figures complete the firehouse diorama started in Series 6, so pick them up and complete the iconic front doors! Mecha Will Rise is a figure line of advanced radical mechanical soldiers from Devil Toys. Each figure is highly detailed featuring a wide range of motion and custom-tailored attire. All the action and drama of DC, Marvel, and Star Wars can come alive on your walls as exciting artwork. With vivid scenes, characters, and colors as well as vintage and contemporary styles, these selections are sure to add style and adventure to any wall. Already ordered Year of the Rooster Prime, but that Monster of Monsters Godzilla... That's something I've had my eye on for a while.